So, this is it – the Black Raven Armoury Blog. It’s been a while coming, forty years in the making to be precise. The coming articles will be a cocktail of how-to guides, personal experiences, musings and streaming of consciousness and we thank you in advance for taking this journey with us. We‘ve asked ourselves this question a lot lately and we believe the correct answer is this… it’s all Jim’s fault. We all know a Jim… Jim’s a mate, he’s the kind of mate that gives you dead arms first thing in the morning and will fill your salt shaker with sugar. He’ll slip a shot of tequila into every pint he buys you, but is the same guy that would scrub your sick from the hotel carpet at the crack of dawn. Jim may or not be his real name, but we know that when Jim says jump… we should probably jump. It might not make sense at the time, but when looking back at the moment our feet left the ground, we’ll know that it was one the defining moments of your life. Jim said we should write a blog and we think he’s right. Oddly, Jim also tells us that we are the Gok Wan of LARP Fashion… At this point, we have to admit we weren’t sure whether to thank him or thump him…to be fair we probably did both. We understand what he is trying to say though. Personally, we’re very flattered and of course, we could never even begin to compare ourselves to the uber-talented Gok, but we know what Jim meant. We, the Black Raven Team, are no Coco Chanels or Alexander McQueens. However, we do have a sense of style – but then again, most of us do. The thing is, larping can all too often be more about accuracy than fashion and we think that’s a shame. There are some great outfits out there. The difference between looking right and looking good can often be as simple as taking a step back and maybe taking some advice. We’re not saying we’re always right, any more than we’re saying that we’re better than anyone else. All we’re trying to say is, we’ve been around for a long time and have a good eye for detail. Functionality and accuracy will always be amongst the most important elements of larping and re-enactment, but there is also room for a little flair, style and personality. Our creations have featured in countless photo-shoots and graced all manner of shiny surfaces. From posh magazines to the silver screen, Black Raven Armoury has appeared in lots of prestigious affairs. Just pointing out, we’ve no desire to turn larping events into weird Zoolander freakshows, any more than we expect Kate Moss to rock up to the Baftas in my Sigrun leather armour. We simply believe there is no harm in looking our best when we are two feet in the mud. If your armour can be made to turn a claymore, then what’s the harm in having it turn the odd head. So, the idea is to share what we’ve learned over the years and the journey that took us here. Personally, we’d love to hear all of your adventures too. We’re hoping for comments, ideas, feedback and critique and we would expect no less from you all. So – before we begin our scribblings, please feel free to pitch in with ideas on what we should be writing. Do you want to hear about how we bring out detail in leather? Or would you rather hear about what it’s like to be on the set of a big screen production? Or… do you want to hear about the night Sir Jim and the team drank all the mead in the village and woke up in the wrong castle? On a serious note, we’ve learned a lot over the years and we took the long road. 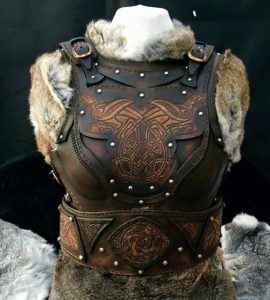 We know from experience how hard it is to find honest and reliable advice on how to make quality leather armour and accessories. We can’t remember how many times we’ve caught ourselves wishing there was an easier way or a simple guide. So, this blog is also partially for a younger Alex and all those like him, who want to make amazing kit and are tired of spending weeks looking for answers in all the wrong places. Consider this blog an A-to-Z of armour, larping and the collected thoughts of Alex Agricola and the Black Raven team.